The use of building information modelling (BIM) software and tools is growing rapidly, especially as a result of the Digital-Built Britain initiative that aims to update and improve the way we plan, build, maintain, and use the country’s infrastructure. To properly take advantage of the many benefits that BIM provides, it must be possible to freely exchange, manipulate, and use the digital information it generates. Collaboration is key on any large project, but in the building industry the variety of software platforms that professionals use makes it difficult to share information. This in turn makes collaboration more difficult than it needs to be. The beauty of using a common data environment is that it makes it possible for people to collaborate no matter what software they use to perform their work. In BIM, the common data environment (CDE) serves as the single source of all the project information used, managed, and disseminated. The CDE is set up and managed by the Information Manager, who is appointed by the client to ensure that the environment is managed effectively. In addition to overseeing the development and maintenance of the CDE, the Information Manager is also responsible for ensuring that the data held within the environment remains secure, and that use and distribution of information is carried out according to prescribed protocols. The Industry Foundation Classes specification is the open data format within the common data environment. 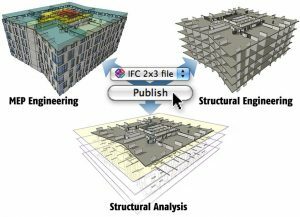 It’s a non-proprietary format that is now the international standard for BIM for exchanging and sharing information from various different software platforms. Based on the IFC data format, it provides designers with a customisable environment where data can easily be input, shared, and used. The IFC data schema is critical for effective collaboration, because it allows data from different sources to be input, used, shared, merged, exchanged, and exported using a unifying data format. This allows for more effective collaboration, as there’s no need to convert data into other formats in order to use it. An additional advantage is that, even though in the common data environment data can be organised and merged in a wide range of different ways, the ownership of all data input into the system remains with the originator. Information can be reused, shared, and manipulated, but it can’t be changed by anyone but the originator. This means it’s easier to keep track of where liabilities lie, even after data is incorporated into the final federated building model. Another quality control advantage is how data is transferred between different information “areas” within the CDE. Generally, there are four different areas: work in progress, the information sharing area, an area for published (client authorised) information, and an archive. Numerous checks and reviews, along with a final approval from a lead designer or team manager, are needed to move information from one area to another. This ensures that data is checked for accuracy and completeness before it’s used for design development, that the client can easily sign off on new information as it becomes available, and that only client-authorised data can be used for design purposes. All of this translates into increased efficiency, and a more effective use of asset data. One of the most beneficial elements of IFC in the long term is that it allows data to be managed and maintained without loss of accuracy or other forms of deterioration. While there maybe certain degree of data lost through translators from authoring tools, it’s minimal in comparison to previous 2D CAD methods. And, using an IFC based workflow means that native versions of data and models can be archived for long-term use, so that accurate and up-to-date data is always available. Ultimately, using open formats makes it easier and faster to import models into the CDE, to validate, merge, and manipulate data, to enrich data for model modification, and to export asset data for use in other applications.